The workshops and trainings delivered by Mellem Education are experience-based, in that participants go through an activity together, and then get to reflect directly on their actions in that activity. This makes the training less theoretical and more practical, giving a real-life relevance to the experience. Often times leadership trainings are merely acting classes on how to act like a leader or look like a leader, but this breaks down in the face of one conflict or a stressful situation. 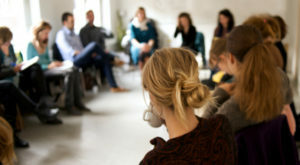 The trainings we deliver focus on the internal, while not being overly psychological, and give participants the practice of self-reflection and awareness of their actions. The trainings have a game-like aspect, making them fun and light, as well as the deeper, more challenging moments of reflection. This balance builds the team atmosphere in the group, and enhances the learning experience. The result leads to an ability to lead while learning from others, approaching challenges as opportunities for growth, and a strong sense of responsibility that inspires others to be responsible as well. Mellem Education’s expert staff offers this training as a consecutive two-day seminar, with a follow-up meeting two months after the training. Another possibility is leading a one-day seminar, followed by another one-day seminar two months later. The structure can be adapted according to the needs of the company.